In Htantabin and Thandaunggyi townships, Tatmadaw military activities such as laying landmines, construction of the road and troops rotation continue from March to May 2018. Local communities are worried about the potential conflicts between arm groups. Landmines continue to be a problem in Toungoo District. The NGO Committee of Internally Displaced Karen People (CIDKP) is running a Mine Risks Education (MRE) program to help local communities avoid the dangers of landmines, supported by Danish Church Aid. 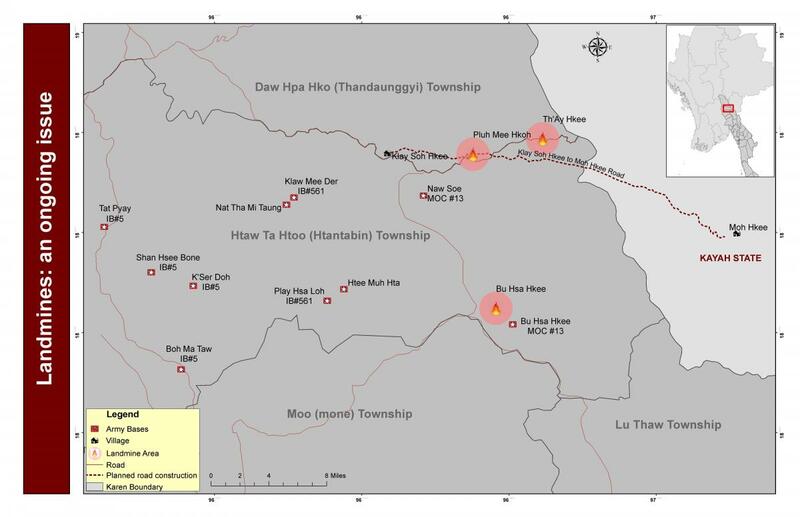 The landmines are located in Buh Has Hkee area and Maw Hkee road, starting from Th’ay Hta to Pluh Mee Hkoh area. The landmines were laid by the Tatmadaw and the KNLA prior to the ceasefire. So far, demining has not started in this area. The Tatmadaw has the goal of building a road from Klay Soh Hkee to Maw Hkee. However, the KNU leaders in Toungoo District did not give them permission to build this road. The KNU leaders reported that the construction of this road could lead to increased tension and fighting. Because this road could facilitate the military expansion of the Tatmadaw, local communities in this area are worried about the potential military road. They are worried that it would make it easier for the Tatmadaw to enter villages in Klay Wa Mu Htaw and Khoh Hkee areas. The Tatmadaw activities continued to resupply its camps in Toungoo District. On April 9th 2018, Tatmadaw Infantry Battalion #5 cut down 350 trees and a full cart of bamboo from the forest by Hsin Kyar to repair their army camp near Shan Hsee Bone village. On April 11th 2018, the Tatmadaw brought a truck to carry the wood back to their army camp. On April 13th 2018, Tatmadaw Infantry Battalion #561 took 15 soldiers from Klaw Mee Der military camp and relocated them to the Nat Tha Mi Mountain area. On April 19th 2018, Infantry Battalion #84 replaced Infantry Battalion #5 at the army camps in K’ser Doh, Shan Hsee Bone, Ta Pyay and Boh Ma Taw areas. Ten soldiers from Infantry Battalion #561 stationed at an army camp in Play Hsa Loh area moved back to the Htee Muh Hta area. On April 26th 2018, Infantry Battalion #582 replaced Infantry Battalion #561 in Klaw Mee Der military camp. Aung Thu Win is the Company Commander of Infantry Battalion #582. Infantry Battalion #561 returned to their original base that same morning. On April 26th 2018, Infantry Battalion #84 stationed in Shan Hsee Bone military camp sent rations to K’ser Doh military camp with two trucks. On April 26th 2018, Military Operations Command #20 replaced Military Operations Command #13 in Ni Si military camp and Bu Hsa Hkee military camps. This rotation included Artillery #81 (2), #71 (2) and #120 (2). Infantry Battalion #582 replaced Infantry Battalion #561 in Play Hsa Loh military camps. The Battalion Commander is Ye Win and the Battalion Deputy Commander is Thu Ya. In Toungoo District, local communities live in fear of renewed conflict between the Tatmadaw and the KNU. Local communities are worried about the increasing presence in KNU controlled areas and would feel safer if the Tatmadaw retreated from areas under KNU control. Local communities feel that even if the Myanmar government and the KNU signed the Nationwide Ceasefire Agreement (NCA), they do not trust each other. This increases the potential for renewed violence.